Collins House is situated near the corner of Collins and William Streets, in a central city location that is often regarded as the Melbourne’s premier street. The position enjoys close proximity to the Crown Casino, Collins Street Shopping Precinct, Southern Cross Station, Flinders Street Station and numerous transport routes. Collins Street is Melbourne’s Fifth Avenue and Wall Street combined with elegant tree lined boulevards, classic Architecture, Melbourne’s most exclusive boutiques and the financial heart of the city. No other street in any of Australia’s capital cities, has the charm and style which includes in its mix of three churches, five leading hotels, two live theatres, the splendid Town Hall – civic building plus the “Paris End” with international five star shopping, leading clubs, all the banks, financial services, medical specialists, leading legal firms, great eating, commercial offices and major media outlets! The building residential product has been structured into 3 distinct components. 3. Collins Club – levels 46 and above – Penthouses, 3 bed, 2 bed and 1 bed product. The interior design of the apartments is of remarkable quality, featuring timber floors, Miele appliances. The finishes palette features a blend of natural materials and contemporary products. 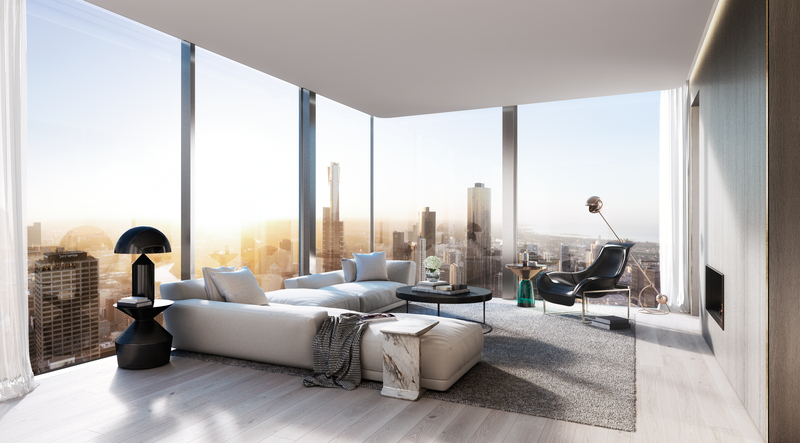 All of the living rooms and bedrooms in the development have been carefully planned to maximise direct access to natural ventilation and light, and many apartments enjoy sweeping views of the Melbourne CBD and leafy inner northern suburbs. The development also features facilities such as private outdoor dining, lounge and BBQ area located at Level 3 and Level 30. Each of these luxurious spaces has been inspired by the Melbournians love of outdoor living and is designed to enhance the Collins House experience. Common amenities such as the lounge & dining rooms provide an element of everyday luxury and take on a distinctly Victoriana Era inspiration. Australia’s most respected design firms. Principal pedestrian access via the Collins Street main entry lobby. Secondary access via St James Lane. Vehicle & services access via St James Lane. – Multiple levels of car parking within a fully automated, self-contained car parking system capable of automatic removal and retrieval of vehicles. – Collins House – 1 & 2 Bedroom Apartments. – Collins Terrace – indoor kitchen & lounge, outdoor dining, lounge & BBQ area for all residents use. – St James Club – indoor kitchen & dining space, outdoor lounge & terrace/BBQ spaces for all residents use. A centralised services core (consisting of 3 passenger lifts, fire stairs and a combined chute for garbage and recycling materials) serving all apartments. Three lifts servicing levels Ground to Level 21 and two lifts servicing Level 22 to Level 61 of the apartment tower. The designed waiting interval for the passenger lifts is within the best practice design guidelines using high speed lifts. Expected Date of TOP: The anticipated construction commencement date is second half 2015. Construction completion is likely to be inside 3 years from the Commencement date subject to detailed construction programming. The Golden Age Development Group is a privately owned property development company based in Melbourne. 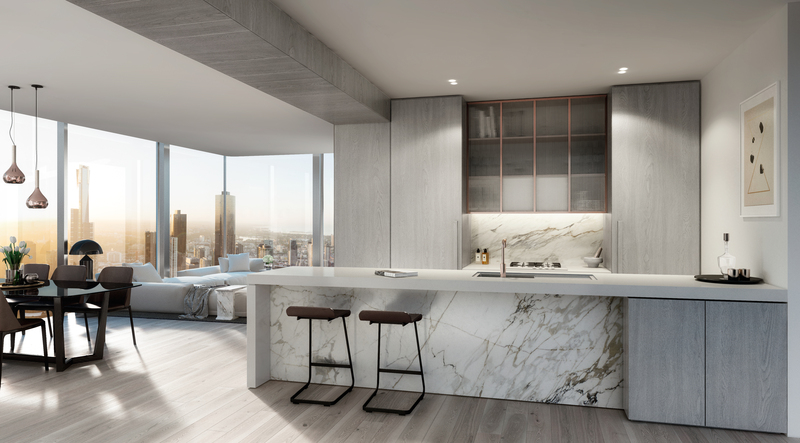 With a focus on developing premium residential projects within inner city Melbourne, the group is committed to designing and developing signature, high‐end quality developments. For more information visit http://www.goldenagegroup.com.au. – John Street Box Hill – 65 apartments, winner of RAIA State and National Awards for Multi‐Residential Projects. 2. Within 3 working days from booking date. Buyer to sign Contract of Sales For each apartment sale, three (3) Contracts of Sale are required to be signed by both the Purchaser and the Vendor. a. One (1) copy is to be retained by the Purchaser for their records. b. The remaining two (2) copies are to be returned to Golden Age office for processing. Together with “Contract Execution Checklist” & TT 10% payment “(account info tba)”. Buyer’s S$5,000 will be refunded upon acknowledgment of receipt from Vendor Solicitor. 3. Buyer to secure a loan 6 months before completion. For more information on Collins House @ Melbourne, simply filled up your details below and our salesperson will get contact with you shortly!